In the blue corner is Chelseaâ€™s Captain Indestructible, John Terry â€“ a fearsome leader with a body carved from granite. 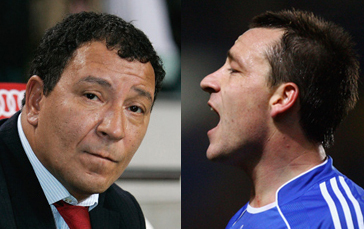 While, in the (erm) other blue corner is Henk Ten Cate â€“ a hard-nosed disciplinarian with a previous record of violence. The two are said to have had a heated argument before the Carling Cup Final â€“ but if push came to shove who do you think would be the last man standing?